Pulisic injured - Quad strain which is a concern. Lampard defends Sarri - respects his ideas and claims that he has been unfortunate. Hudson-Odoi talks England, being back at Chelsea. Drogba urges Chelsea to give David Luiz and Gary Cahill new contracts. Rob Green reveals what he does at the club as third choice. Higuain retires from International football to focus on his family and Chelsea. Hudson-Odoi offered MEGA new Chelsea contract. Drogba compared Eden Hazard to Gianfranco Zola. Makelele reveals that he threatened Ronaldinho. Kovacic and the Real Madrid fall-out. 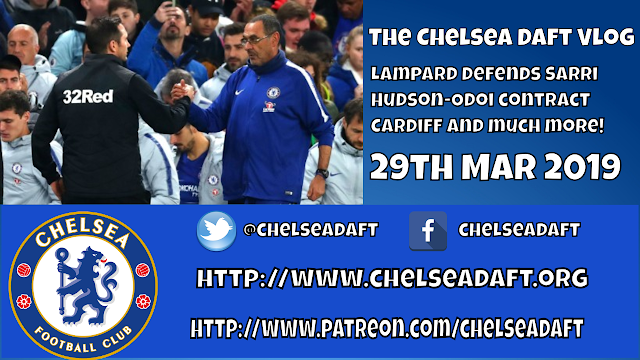 Cardiff - Make or break for Sarri.